As well as a sub 15 minute 5K, my main goal for 2018 was to write one of these race journals. Now, I don’t think it will win any awards, but, I hope you do enjoy it, and if you don’t – keep it to yourself, no one likes a moaning Myrtle. Chances are it’s also going to be quite long, so am sorry in advance, it will also no doubt have a smattering of typos, gramma issues and misuse of words (that I obviously don’t understand so don’t go all Mr. Love on me (Mr. Love was my High School English teacher BTW). 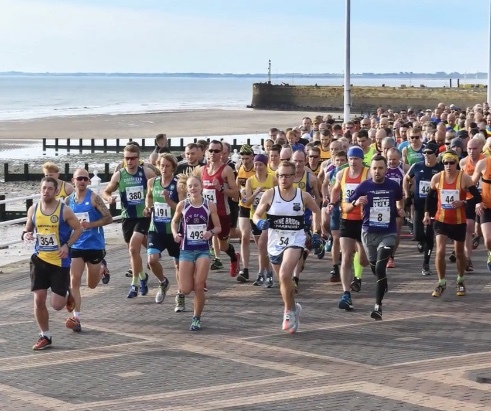 Hosted by Bridlington Road Runners and supported by Bridlington Rotary (I don’t know what that really means or why I wrote it), you could describe this as a seaside pancake flat coastal route, but, you would be lying, so why o’ why do it I here you say? Like most, I generally take a scatter gun approach to which races to do, I book on as many as possible, moan (Myrtle styley) to anyone who will listen (and those who won’t) and then start the preparation of the yeah well/excuse bank. This time it was different as I spend a lot of time in the Bridlington/Flamborough area throughout the year. 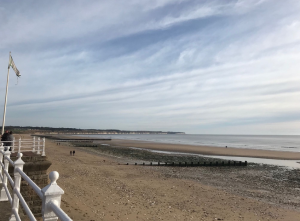 I could lie and say it’s because it’s a relaxing place, picturesque, bursting with character, heritage and history (which it is, in fact did you know the beach at Flamborough was used in the filming of Victoria this year?) but the fact of the matter is my mate has a house in the village, ergo free weekends away – Win/Win. The fact I had one of those said free weekends away in October and it coincided with the ‘Brid’ Half (as it’s known to locals) made it a Win/Win/Win situation. As my Strava heat map would indicate, Flamborough is only rivalled by Newcastle and Sunderland (Gods Country) in terms of places I have ran, with a splodge of red and blue lines in and out of the village. The race description of ‘undulating’ was very appropriate from my extensive knowledge of the area and I could also see in some areas I was going to go to a lonely place and if it was windy, I was in for a fun time. 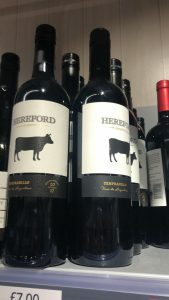 Never the less Mal (Malbec) said stop being a looser and do it, we argued for a bit (at least half an hour/half a bottle) and I agreed in the end. 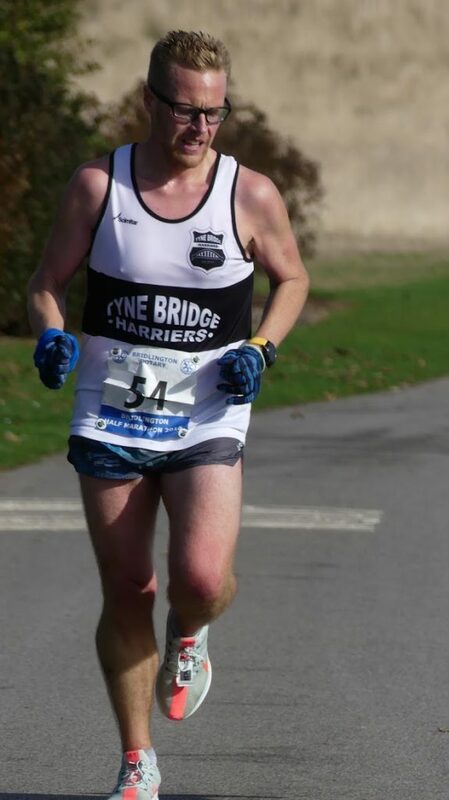 It was done; race place confirmed, Billy (Barclaycard) debited, there was no turning back….costing about a third of the price of the Great North Run I was in – Win/Win/Win/Win/Win. 600+ Words into this, you are probably thinking yeah, yeah, yeah, but, what happened in Mile 3, patience my young padawan, a good story teller always sets the scene and gives context before getting into the exciting stuff. Where was I, yes, Mal and Billy – they made me do it. Ok on to the race, or let’s start with the pre-race. When it comes to race prep I can be quite disciplined, I generally don’t drink or eat rubbish and up until I landed in ‘Flam’ (more local dialect) it was all going swimmingly, low mileage and a weeks’ worth of good snap (food) under my belt……..enter Mals’ friend Tiny Temper (Tempranillo – my fav)….via a special offer at the local co-op, am a sucker for a good bargain. I had a ‘few’ Friday night and figured, that’s alright just be ‘Good Dave’ tomorrow and it won’t make a difference. I’m sad to say ‘Good Dave’ didn’t make this particular trip, in fact good Dave had been replaced by fat Dave and Tiny on this particular trip, who both came out to play Friday AND Saturday night. Come 7.00am Sunday morning, alarm bells were ringing in more ways than one; a quick peak out of the window and the observation of the swaying of the branches of the trees (and its direction) and I wasn’t in my happy place, was it really that windy or was I still slightly under the influence? Arrival, and having done my usual checking out of the competition, I was quietly confident I was as foreign a runner as there was going to be today, all local running clubs and I could tell by the accents there wasn’t many here that were north of Filey. Running for TBH and living in Sunderland (Gods Country) can sometimes be a tricky situation in terms of always being referred to as a ‘Geordie’. Today was no exception. A few confusing looks from the locals (either at the name on my vest or the fact I was sporting gloves – it was really cold) and I found myself on the start line – literally the start line, front and centre with all of the ‘big lads’ and a young lady from Hull Running Club who was hotly tipped to be first lady back, more on Carla later. 10am on the dot, the sound of the whistle (that sounded like it needed the pea replacing) and we were off. For the first time in a long time, I started a race with no anticipation, no target to hit, no goal in mind, just get round in a respectable time and dare I say it ‘enjoy it’ – anything between 85-88 minutes and I would have walked away a Happy Harrier (instead of a moaning Myrtle) but, considering I was carrying more than my usual alcohol and harribo quota, I figured it could be a long day at the office. Now, the next problem (of many am sure) with my report is that am a KM type of guy, much to the bemusement of some of the chaps from the clurb (it’s a bit like new money vs old money I think). KM 1 – 5, as is generally my way, I knew I was going to go off quick – Today was no different. I went off with the lead pack of 7 runners and was flanked by another fella (Matt from Humber) and Carla. After the first Km (closer to my 10K pace I might add), I managed to settle into a rhythm of something closer to my usual half pace for the next 4 in the hope that I hadn’t blown it before I really got started. 3K in and Matt was on his way and I wasn’t going to go with that pace (even Tiny didn’t think it would have been a good idea), Carla started to pull away but I stuck with her for a few more before she dropped me like a bad habit just passing 5K and hitting the first (of many) ‘climbs’ of the day, heading past Daynes Dyke up to Flam Village. All the time I still had sight of the lead pack and the lead car (am sure it was a Ford Sierra) but things had started to break up; me then Carla and then Matt pushing to keep within squinted eye sight of the lead group. First 5K in 19:16, a little bit quicker than planned, but, not beyond salvage. KM 6 – 10, the sharp left turn at Flam could only mean one thing, I was heading into what I suspected would be the darkest part of the race. A few supporters outside of the Church and a well-placed water station a little bit further along would be the last humans (with the exception of the superb marshals on route) I would see for a while, in fact I would hit 10K on the approach to Bempton – a pretty little village on the main road out of Flam – before I saw the next member of the public (a supportive chap on his bike who even managed to give me the ‘Go on Tyne Bridge’ salutation which was very welcomed). A 3.42 (don’t ask), 4.00, 3.57, 3.59 and 4.05 felt a bit more sensible at this stage of the race, 20 seconds off the required 20:00 I was looking for on this 5K. Slightly erratic pacing, but, I put this down to the undulating nature of the route. As I hit 10K I started to wonder when the wheels would fall off; from reviewing the course route I had always though the second half would be the business end of the race. The internal dialogue had started with earnest, ‘whatever happens we are still going to be under 1.30’ ‘don’t f it up now’ ‘look a bear’ etc etc. KM 10-15, 3.50, 4.15, 3.54, 3.48 and 3.48, 35 seconds off the required….hold on a minute? Gary (Garmin) is either messed up (which has been know) or I have just flew round potentially the worst stretch of the race, Tiny assured me I was ok though and with no more bear sightings I marched on. 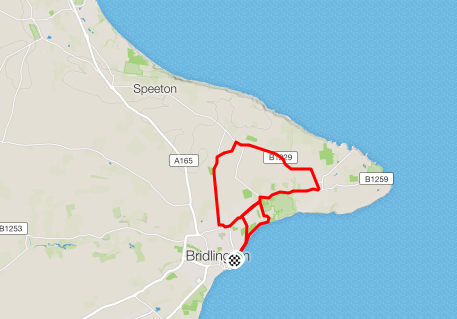 As I suspected, this was a difficult part of the route, I left Bempton and I knew once I took that left turn back towards the coast, the wind would be in my face for at least 3K in what was starting to feel like a critical part of the race. To get me onto the final stretch I had to dig down deep and churn out the kilometres (as the Americans would say – kilometres not churn) Carla was off in the distance now so I couldn’t use her like I had used Phil Scott so many times as my wind shield; besides, she wasn’t in the same height department as Mr S. At this point I did try to take in the beauty of the area, and could see all the way to the coast from this vantage point, the sun was breaking and reminded me of why I love the area so much. As the splits suggested I survived and as I approach 10 mile (for the old money reader) I realised a PB could be for the taking if I didn’t screw up the last section. KM 16-21, the last stretch of the run covered the most built up part of the race (and the more even in terms of elevation – more importantly) the wheels were still on this bad boy. Only a short while ago Carla and Matt had seemed so far off, but, now I was gaining, had they slowed and I was just continuing pace or was I gaining some ground?? The honest answer is I don’t know, and didn’t really care. As we ran down Church Lane through the grounds of Sewerby Hall I felt like I might catch Matt and be pretty close to Carla. Sewerby Hall and Gardens is a great place to visit if you are in the area, it’s beautiful; they have a train, a zoo, lovely gardens and a play areas for the kids etc. Sewerby is also a decent parkrun (in the right conditions) and the grand finale before hitting the promenade we had started on took in the first section of said parkrun. What I perhaps should have mentioned earlier is that this was my first time experiencing running on roads that weren’t closed, so we had to stay tucked into the left whilst cars overtook on 80% of the route, which can be a surreal experience on country lanes! Bearing this in mind, the head went down on that first section of the parkrun I mentioned earlier (at this point I surely wasn’t going to get ran over on a path right?) and before I knew it I was running on a path that not only did I have to share with dog walkers, skateboarders and pedestrians but also a land train which was hurtling towards me! I looked up just in time to switch over to the left hand side of the path to avoid a major collision! That disaster averted and low and behold as I make the promenade approach for the final stretch here is Mad Matt (as I have now started to refer to him). The bloke had quite simply ran his skin out, but, I suspect he had ran out of steam on the last part of the race; I don’t know about anybody else but I passed him with 800 meters to go feeling a certain sense of guilt, it lasted about 5 seconds…but guilt all the same. As I approach the finish line I had also edged closer to Carla; I couldn’t have caught her though, not even with another 500 meter stretch, and she came in under the 82 minute mark in 9th place and (as predicated) first lady back. With Matt out of sight I ‘gracefully’ crossed the finish line in a very respectable and unexpected time of 82 minutes and 8 seconds, stopped the watch, wiped the spit from my face, quickly took of my gloves before anyone saw them, shook Carla’s hand and thanked her for helping keep my head in the game and grabbed a cup of the H2O….job done, mission accomplished and feeling very pleased with myself. Matt quickly followed and we also chatted for a few minutes about the race and how we found it; all jokes aside there is nothing quite like the running community and how you can just speak to anyone quite randomly after a race at length without reaching for mace! Considering my previous PB was at the Great North Run a few weeks back with a time of 84:21 I couldn’t quite believe it. And as a Brucie Bonus I picked up £25 for finishing 1st MV35! And your result wasn’t bad either haha!! Great report and time Dave, but what’s all that stuff about bears?